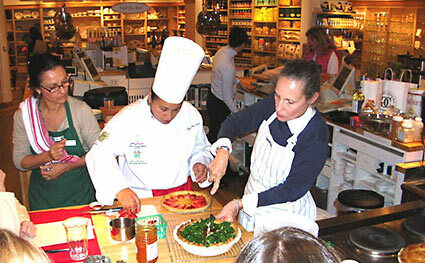 Penny Keaton (at right in striped apron) with Chef Eviolet Guerrero and students at one of her frequent appearances at Williams-Sonoma stores in Southern California. Professional baker and educator, Penny Keaton (now also known as the Pie Queen) learned to bake as a young girl by watching her mother, Rose and her aunts Aggie, Jean and Helen  all of whom were accomplished bakers. The cold winters and rainy days in rural Long Island, New York contributed by giving her and her younger sister Gale lots of indoor time to perfect their techniques and learn lots of recipes. As a new mother in the early ‘70’s, Penny had more time to spend on her baking. With her her young son Joshua at home, she started working on modifying many of the recipes she had so that they could be made from healthier, less processed ingredients and less refined white sugar. Around this same time, Penny started being known as the expert among her family and friends, in regards to baking and particularly pies. Whenever there was a dinner party, barbecue or other get-together, she was the one asked to bring the dessert! Many years went by, which included a move to the West Coast, new friends, new jobs, relationship changes (the start of what was to become her 2nd, current marriage can be directly traced to her apple pie!) and still Penny’s pies were in high demand. Friends and acquaintances often told her that she should “open a pie shop” and many asked to buy her pies for special occasions and holidays. 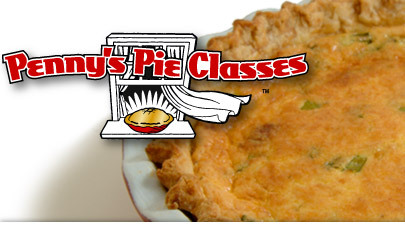 Several years ago, one of Penny’s close friend asked her to help make a pie for the friends' fiancé. It was his grandmothers’ recipe for apple pie, and it had a shortening-based pie crust. As it turns out, Penny had never made this type of pie crust, having been taught a much simpler and faster oil-based dough by her mother. You'd never know it, but these award-winning pies are simple and even fun to make! The pie crust contains only 3 ingredients (no kidding). Photograph by Jill Johnson, The Outlook News, La Cañada, CA. In the fall of 2002, while Penny and her husband Al were visiting his mother in Southern Idaho, they attended the local county fair. There she saw the pies entered in the baking competition, and she got the idea of competing herself. Upon returning to Los Angeles, they attended the L.A. County Fair in Pomona, CA. After seeing the many fabulous entries there, Penny decided to compete the following year. 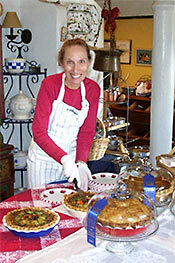 2003 came around and Penny entered 7 pies and a batch of lemon bars. Being that the L.A. County Fair is the largest of its kind, and many of those competing are highly accomplished bakers with many years of competition experience, Penny had no real expectations of placing in or winning any of the categories she had entered. It came as a rather substantial surprise when she found that she had won a total of 7 ribbons! 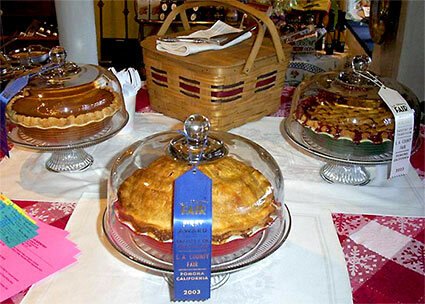 She won first place for her apple, pumpkin and pecan pies, third place for cherry and French apple pies, a third for the lemon bars and fourth for peach pie! Shortly after that, Penny started displaying several freshly baked pies at the Montrose Harvest Market, her local weekly farmer’s market where she buys fresh, organically-grown fruits and vegetables. The purpose of the display was not to sell pies, but rather as a marketing research activity to see if there was any public interest in pie baking lessons. It was found that there was a very large interest, as over 50 people signed up on the list for more information about these classes in a few short hours. Penny started delivering private lessons in peoples’ homes, and then expanded her delivery capacity by conducting classes at Paolo’s La Cucina, a cooking school in La Canada, CA, the town where they currently live. For many years, Penny has been planning to write a cookbook, containing many of the recipes that have been passed down through the generations of her family and friends. She realized, though, that she learned so much about cooking and baking by seeing it done, especially by observing her mother, and later by watching Julia Child on television.This resulted in her putting her pie class secrets on video so others could see the techniques and procedures being used. 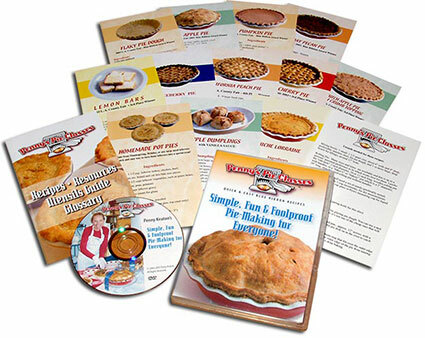 First released at the 2004 L.A. County Fair, Penny's "Simple, Fun & Foolproof Pie-Making for Everyone" DVD has helped many learn the simple, flaky and delicious recipe for easy pie baking. Many have since "reported in" to Penny with their successes and accomplishments after watching the video and putting what they learned into action. Several had never attempted a pie before, and were now making a couple a week! Others said that previous experience with "difficult to make" pie crusts had them intimidated, or even "scared" to tackle making a pie. Give us a call at (818) 209-2191. 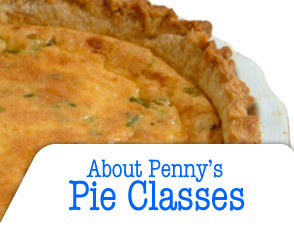 Penny loves to hear from anyone who has learned and used her techniques to create perfect pies, and welcomes e-mails and calls. When she is not conducting classes,doing demonstrations or working in her consulting business, she can often be found in her home “test kitchen” with her granddaughter Sierra, making something scrumptious for family and friends. You too can learn to bake like a professional. 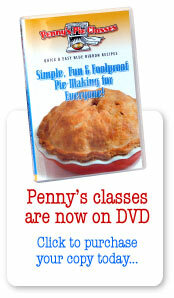 Purchase your copy of Penny's new "Simple, Fun & Foolproof Pie-Making for Everyone", available on DVD for only $19.95.